by French journalist and political activist Thierry Meyssan. 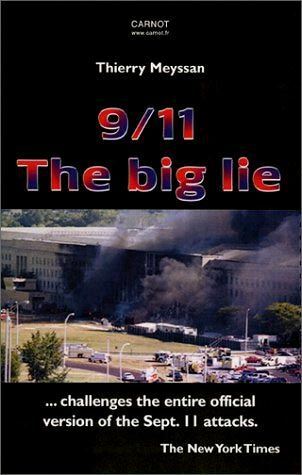 Its English edition is entitled 9/11: The Big Lie. We present below a transcript of the presentation given by Thierry Meyssan on 8 April 2002 at the Zayed Center in Abu Dhabi (United Arab Emirates), at a gathering organized under the auspices Arab League and attended by the diplomatic corps and the international press corps. This presentation was followed by questions and answers, which are in the process of being transcribed and translated. In the first minutes following the first attack on the World Trade Center, officials suggested to the media that the person behind the attacks was Osama bin Laden, the epitome of Muslim fanaticism. Not long after, the recently appointed director of the FBI, Robert Mueller III, designated nineteen kamikazes by name and mobilized all the means at the disposal of his agency to track down their accomplices. The FBI thus never undertook any investigation but, instead, organized a man hunt, which, in the eyes much of the United States public, quickly took on the appearance of an Arab hunt. This reached such a pitch that people were incited to attack - even kill - Arabs whom they naively considered collectively responsible for the attacks. 1.We know about only four planes, whereas at one point it was a question of eleven planes. Further, an examination of the insider-trading conducted in relation to the attacks shows put-option speculative trading in the stock of three airline companies: American Airlines, United Airlines and KLM Royal Dutch Airlines. 2.The official version does not include the attack on the White House annex, the Old Executive Office Building (called the "Eisenhower Building"). Yet, on the morning of the eleventh, ABC television broadcast, live, pictures of a fire ravaging the presidential services building. 3.Neither does the official version take into account the collapse of a third building in Manhattan World Trade Center complex, independently of the twin towers. This third building was not hit by a plane. However, it, too, was ravaged by a fire before collapsing for an unknown reason. This building contained the world's biggest secret CIA operations base, where the Agency engaged in economic intelligence gathering that the military-industrial lobby considered a waste of resources that should have been devoted to strategic intelligence gathering. According to the Defense Department, a Boeing 757, all trace of which had been lost somewhere over Ohio, flew some 500 kilometers (300 miles) without being noticed. It supposedly entered Pentagon air space and descended on to the lawn surrounding the heliport, bounced off the lawn, broke a wing in collision with an electric transformer station, hit the facade at the level of the ground floor and first story, and was totally consumed by fire, leaving no other traces than two dysfunctional black boxes and pieces of passengers' bodies. It is also obviously impossible that a Boeing 757 could enter the Pentagon's air space without being destroyed by one or more of the five missile batteries protecting the building. When one examines the photographs of the facade, taken in the minutes following the attack (even before the Arlington civilian fire fighters had time to deploy), one sees no trace of the right wing on fire in front of the facade, nor any hole in the facade into which the plane could have been swallowed up. Apparently without the least fear of laying itself open to ridicule, the Defense Department declared that the jet engines, made out of tempered steel, had disintegrated under the shock of the impact - without damaging the facade. The aluminum of the fuselage is claimed to have combusted at more than 2,500 Celsius within the building and to have been transformed into gas, but the bodies of the passengers which it contained were so little burned that they were later identified from their finger prints. Responding to journalists during a press conference at the Pentagon, the fire chief claimed that "no voluminous debris from the aircraft" had remained, "nor any piece of the fuselage, nor anything of that sort". He declared that neither he nor his men knew what had become of the aircraft. Several hundred witnesses have claimed that they head "a shrill noise like the noise of a fighter-bomber", but nothing like the noise of a civilian aircraft. Eye-witnesses have said that they saw "something like a cruise missile with wings" or a small flying object "like a plane carrying eight or twelve persons". The flying object penetrated the building without causing major damage to the facade. It crossed several of the building rings of the Pentagon, creating in each wall it pierced a progressively bigger hole. The final hole, perfectly circular, measured about one meter eighty in diameter. When traversing the first ring of the Pentagon, the object set off a fire, as gigantic as it was sudden. Huge flames burst from the building licking the facades, then they shrank back just as fast, leaving behind a cloud of black soot. The fire spread through a part of the first ring and along two perpendicular corridors. It was so sudden that the fire protection system could not react. All these testimonies and observations correspond to the effects of an AGM[air to ground missile]-86C of the third (most recent) generation of CALCM [conventional air launched cruise missile -- see picture HERE,] equipped with depleted uranium warheads and guided by GPS [global positioning system]. This type of missile, seen from the side, would easily remind one of a small civilian airplane, but it is not a plane. It produces a shrill whistle comparable to that of a fighter-bomber, can be guided with enough accuracy to be directed through a window, can pierce the most resistant armor and can set off a fire - independent of its piercing effect - that will generate heat of over 2,000 Celsius. In view of the elements that I have just presented, it appears that the attacks of September can not be attributed to foreign terrorists from the Arab-Muslim world - even if some of those involved might have been Muslim - but to United States terrorists. The day after the attacks of September 11, United Nations Security Council Resolution 1368 acknowledged "the inherent right of individual or collective self-defense in accordance with the Charter", calling on "all States to work together urgently to bring to justice the perpetrators, organizers and sponsors of these terrorist attacks and stresses that those responsible for aiding, supporting or harboring the perpetrators, organizers and sponsors of these acts will be held accountable".